Grunge isn t dead but was it every truly alive? Twenty years after the height of the movement, The Strangest Triberedefines grunge as we know it. Stephen Tow takes a second look at the music and community that vaulted the likes of Nirvana, Pearl Jam, Mudhoney, and Soundgarden to international fame. Chock-full of interviews with the starring characters, Tow extensively chronicles the rise of rock 'n' roll's last great statement and contextualizes what the music really meant to the key players. Delving deep into the archives, Tow paints a vivid picture of the underground rock circuit of tattered warehouses and community centers. Seattle's heady punk scene of the late '80s gave birth to a rowdy and raucous movement, influenced by metal, but wholly its own. Seattle made its own sound, a sound that came to be known internationally as grunge. Tow walks the reader through this sonic evolution, interviewing members of every band along the way. In 1991, Seattle's sound took the world by storm--but this same storm had been brewing in the Pacific Northwest for a decade before it hit MTV.The Strangest Tribeis a reframing of this last transformative era in music. Not just plaid shirts, bleached hair, and angst, grunge is a word used to describe a rich community of artists and jokers. "...an interesting glimpse into a time of extraordinary ferment amidst a revolutionary musical subculture." "If The Strangest Tribe were a Seattle band, it would be Mudhoney. The book was published by a small, Seattle-based independent press called Sasquatch Books and deserves more attention. A geeky and infectious enthusiasm permeates Tow’s work, and his approach allows him to emphasize the diversity of the Seattle music scene and profile a number of bands that didn’t fit into the grunge mold." "Tow brings in the voices and first-hand accounts of the heaviest hitters in Seattle who really tell it best." "As a lifelong Seattle native of a certain age, I was there for it all - and can vouch for the fact the The Strangest Tribe gets it right. The author even discusses details such as small parties in Belltown, the events of which would one day alter music history... The cooperation Stephen Tow received was invaluable. The hundreds of interviews he conducted and obvious research have paid off substantially. For an "outsider" (he lives in Cheltenham, PA) Tow has done an outstanding job of telling the real Seattle music story. 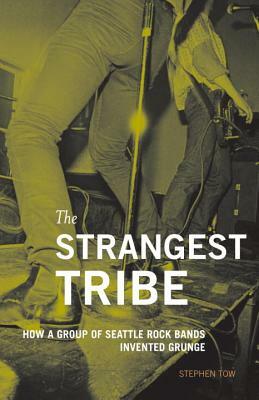 The Strangest Tribe is a great read." "While many of the bands that Tow writes about have little to do with grunge as the world came to know it, his attention to detail and appreciation of Seattle music history create a wonderful backdrop for the phenomenon that was to come. You feel like you were there, even if — like Tow — you weren’t." "Tow’s book is a grunge encyclopedia. Its in-depth storytelling touches on familiar names, long-forgotten music venues and bands that lasted only a few days. It talks about a music scene frequently at war with police and city officials. And like the music itself, his interviews invoke a dirty, feedback-heavy story of a once-in-a-lifetime culture." "Details. Stephen Tow’s book, The Strangest Tribe: How a Group of Seattle Rock Bands Invented Grunge, has a lot of them, and though there’s a mountain of information, it isn’t overwhelming. It’s scholarly but entertaining, interesting and funny; it’s researched to no end but quite relatable for both musicians and music fans." "Stephen Tow takes a second look at the music and community that vaulted the likes of Nirvana, Pearl Jam, Mudhoney, and Soundgarden to international fame. Packed with interviews with the starring characters, this book extensively chronicles the rise of rock 'n' roll's last great statement and reveals what the music really meant to the key players." "...the definitive history of the Seattle music scene that went from beer-stained garage band obscurity to globally iconic in the space of a few years. Tow digs deep into the pre-historic, establishing the geneology of seminal, but lesser-known pioneers — band like the The U-Men, Green River and the Thrown Ups — that established the aesthetics and infrastructure that eventually made bands like Nirvana and Pearl Jam household words and Seattle itself the center of the known universe in the early 90s." "...Tow's comprehensive and insightful book will delight the serious fan and reward them with a deep and extensive story of the music scene and the grunge bands that put Seattle on world's music map." "...if you’re like me, and you believe Seattle bands like Mudhoney, Nirvana, Pearl Jam and Soundgarden were the source of some truly inspired rock moments, then Delaware Valley College professor Stephen Tow’s well-researched examination of the scene that spawned them is a must-read—one that’s written with the impassioned perspective of a historian in love with his subject."